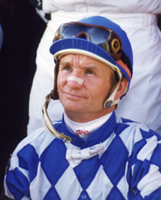 Pat Day, one of most successful jockeys in Thoroughbred racing, will make a special appearance at Sam Houston Race Park on Friday, September 10, 2004 to benefit the Racetrack Chaplaincy of America. Day, who was inducted into the Racing Hall of Fame in 1991, has won over 8,200 races in his celebrated career. He has won nine Triple Crown races and 12 Breeders' Cup victories, including four wins in the Breeders' Cup Classic. Day, 51, is an ardent supporter of the Racetrack Chaplaincy of America and is traveling to racetracks across the country to raise funds for this respected non-profit organization. Many racetracks across the country have a track chaplain; at Sam Houston Race Park John Shumaker offers assistance to the horsemen, grooms, jockeys and other individuals who make their living in racing. The various programs include a Sunday morning worship service for horsemen and race patrons. The Chaplaincy also provides clothing, blankets and food for backside workers in need. Counseling is provided for spiritual, emotional and financial needs, as well as for gambling, marital and drug and alcohol problems. The Chaplaincy program, in conjunction with the racetrack, organizes special Thanksgiving and Christmas dinners for track workers who may be away from their families during the holidays. On live race nights, the Chaplain leads a prayer service for the jockeys, offering a reading and inspiration for the men and women who courageously battle for each victory. State and national horsemen's organizations fund the Racetrack Chaplaincy Program. Twice a year, Sam Houston Race Park organizes a fundraiser with a silent auction and other events to raise money. The track also donates 2% of its live on-track handle to fund the valuable and needed services of the track Chaplaincy program. Day will appear at a benefit luncheon with the proceeds to benefit the Racetrack Chaplaincy program. He will also ride a charity match race during the Friday evening card, competing against one of the leading riders at Sam Houston Race Park. "We are very grateful that Pat will take time from his riding commitments to join us for this fundraising effort," said Chaplain Shumaker. "We hope that racing fans will come out to meet Pat and help support our many programs which assist our riders and backstretch workers." For more information on Pat Day's appearance at Sam Houston Race Park on Friday, September 10 or to purchase tickets for the benefit luncheon, call (281) 807-8760.